Today is Earth Day. When I think of Earth Day I think of spring time, planting trees and community clean-ups. I also think about the spring planting season on the farm! However, this year rather than being in the field planting our crops, we are waiting for things to dry and warm up. I ran across this quote in an article from Jay Baer, a national social media consultant, the other day and fell in love with it. 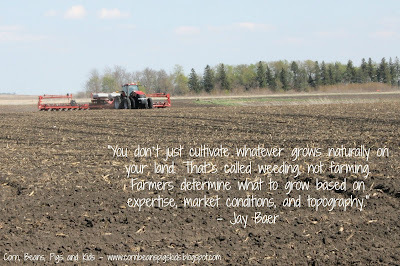 I was reminded of it today, on Earth Day, as farmers across the Midwest wait to plant due to current soil and weather conditions. I decided to take the quote and place it on a photo that I took a little over a year ago of My Farmer planting corn. On Earth Day we are reminded that everyone has a responsibility to respect and care for the land. For some people, Earth Day is the only day they think of that duty by participating in an Earth Day activity. For My Farmer and I, and other farmers across the United States, we make decisions all year long that look at how we can take better care of our land and resources. Farmers have made changes in their traditional practices that have resulted in growing more food on less land and decreases in soil erosion, to name a couple. We make those choices not only for the current year, but so future generations will be able to raise crops on the same land that our great-great grandparents did when they first settled here in the United States. What are your Earth Day plans? I wish more people thought about stuff like this! Great article Val! I was thinking about Earth Day today as the kids brought home items on how they can help save energy. These were practices that were instilled in me at a very early age as my parents believed in re-using, re-purposing and recycling before it was in the "in-thing" to do and taking care of the resources that were/are available to us. As a family we practice Earth Day all year and plan for the generations to come after us to farm our ground as well. Yup, Earth Day is every day for us too. Great post! !